Cazorla dances with the ball and hands it off to Mesut Ozil. The German dishes the ball to Ramsey, who pops it over the back line to Olivier Giroud. 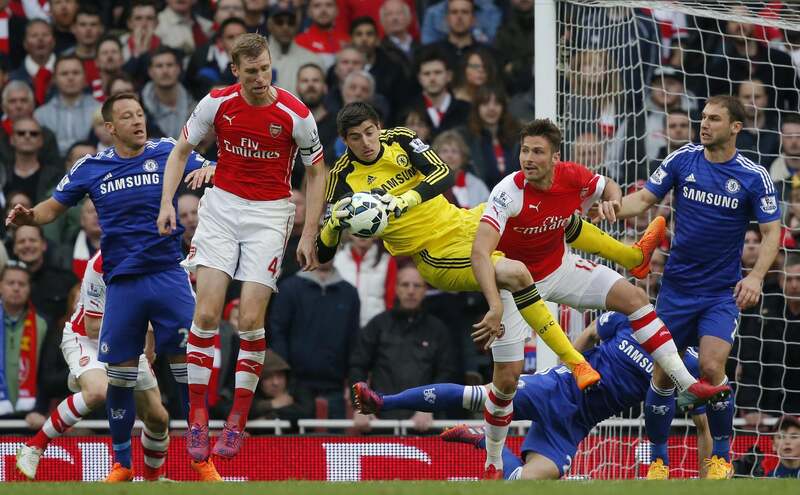 The Frenchman plays keepy-uppy until the ball lands in the arms of Courtois. Fabregas, the former Arsenal captain, boots the ball down-field to Oscar who takes a touch and is knocked out cold by the Arsenal keeper, Ospina. Oscar twitches on the ground before coming to his senses and rubbing his head. No foul is called. Oscar has a concussion but will play on. The whistle sounds. Ivanovic puts his fist in the air. Win the next two games and the title belongs to Chelsea. Leicester City are a team fighting relegation, and Chelsea play them away at the King Power stadium. Leicester City’s manager, Nigel Pearson, once choked a guy on the pitch. Danny Drinkwater, one of the best names in the Premier League, dinks the ball between Matic’s legs, to Matty James who runs upfield. James spots Vardy making a run between Cahill and Terry and sends a well-weighted pass into the Chelsea penalty box. Hardy scoops the ball up and sends it across the face of the goal. Terry and Azpi miss the ball and it rolls slowly to Marc Albrighton who slots the ball into the net. Halftime. Where do Chelsea find two goals? Hazard shuffles on the flank and passes to Willian, who shuffles as well before pinging it back to Hazard. The Belgian wunderkind lofts the ball over 3 defenders to Ivanovic, who lets it fall off his foot and into the penalty area. He recovers the ball and sends it to the middle of the box. There it’s met by Drogba, who shoots towards the far post. Goal. Fabregas sends a corner kick into the box. The ball bounces around in the box before John Terry taps it in the net. He’s now tied for the most goals ever scored by a defender in the Premier League. 2-1. Chelsea are going to win the title. Again, Fabregas. He’s dribbling on the edge of the penalty area. Somehow he spots the run of Ramires and sends the ball to the top of the box. Ramires, in full sprint, arrives to smash the ball into the net. Crystal Palace are a recently-promoted side that stayed in Premier League comfortably last season. Right before this season started, their manager quit. Another manager took his place, but he was sacked right after Christmas. A former Palace player, Alan Pardew, left Newcastle to take over the job. He once head butted a Hull City player on the touchline. They had a small winning streak for a while, but they’ve faltered in their last two matches. Hazard passes to Willian, who passes back to Hazard, who immediately falls between two defenders. Penalty. Hazard sizes up the ball and kicks a weak ball to the lower right of goal. The keeper blocks the ball and it bounces towards Hazard, who meets it with his head. Goal. Chelsea FC are the 2014/2015 Premier League Champions with three games left in the season.